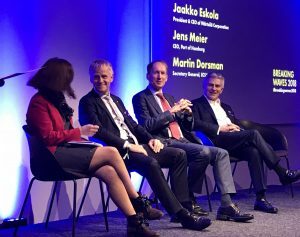 The Breaking Waves 2018 conference attracted leading representatives of the European Maritime Cluster to Helsinki as part of Slush, the world’s leading startup event. The Think Tank on 3 December defined the challenges and targets of the cluster. 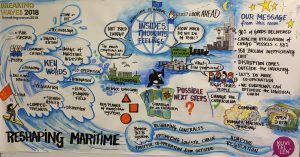 Representatives of the European Maritime Cluster gathered for the first in Helsinki on Monday. Almost 30 international maritime professionals, from decision-makers and business leaders to representatives of ports and shipowners, were invited to the Breaking Waves Think Tank. The Think Tank addressed the key challenges facing the industry and sought solutions to them. The key themes were sustainability, technological advances in the industry and new innovations. All participants in the Tank Tank agreed that the industry needs to react more robustly to changing demands. The participants also agreed that open debate, both within and outside the industry, is an important part of its development. Close dialogue with decision-makers, new actors and startup companies, as well as with customers, is essential to this development work. Gathering data and utilising it effectively were also seen as one solution. Shipping is subject to ongoing transformation, and closer cooperation would enable new ideas and innovations to be utilised more effectively. Shipping enables comprehensive wellbeing, both globally and within Europe. Shipping is a key link in broad logistics chains that enable consumers to purchase products from the other side of the globe online and local grocery stores in Finland to sell bananas, for example. Altogether 90 percent of world trade travels by sea. Optimising logistic chains, comprehensively linking them and improving the flow of information between different actors within these chains was highlighted as an important area for development by the Think Tank. Functional logistics chains provide better opportunities to respond to issues such as sustainability, for example by enabling the vessel capacity to be utilised more efficiently. Similarly, a good flow of information would enable better opportunities to react faster to changing needs and introduce new innovations within comprehensively functional chains. In addition, better communication would help integrate sustainable solutions into the maritime industry and logistics sector as a whole. The participants of the Think Tank recognise that there is a need for better and wider cooperation. The collaboration as such is not enough and the field is craving for stronger action. To secure the competitiveness of the European Maritime Cluster also in the future, there is a need for new perspectives, fresh actors and innovations outside the cluster. The maritime cluster needs expertise from other fields to create the future of maritime in the constantly changing business environment. Developing the education to respond more efficiently the upcoming needs and to question the current ways to operate are seen as key acts to develop the system. Disruption usually comes outside of the field, which forces all of the maritime actors to be prepared and be able to reach. The Breaking Waves 2018 conference marks the first initiative to jointly develop the maritime industry by bringing numerous different actors to discuss these issues around the same table. The job of safeguarding the competitiveness of the European Maritime Cluster also in the future is only just beginning. Tiina Tuurnala is Managing Director of Finnish Shipowners’ Association.